Girl Scouts of the USA’s (GSUSA) National Board of Directors has voted to increase annual Girl Scout Membership Dues to $15 beginning in 2013–2014. Every dollar of the membership dues is sent to GSUSA and provides accident insurance covering members participating in approved Girl Scout activities, program development, research, resources, training and services to councils. The updated fee will be incorporated into the online registration process with 2014 early registration beginning on April 1, 2013. The slight increase will allow GSUSA to provide higher-quality services and resources to members via more efficient learning and tools for delivery of the Girl Scout Leadership Experience, as well as technology that makes joining Girl Scouts fast and easy! At $15, membership remains a great value! Girl Scouts of Northern Illinois is sensitive to the continuing economic challenges that affect many in our council, and realize that this $3 increase may be a hardship for some. No girl will be denied access to Girl Scouting for financial reasons. Financial assistance is available and provides confidential, need-based support to individuals seeking Girl Scout membership. GSNI recently received e-mails from Girl Scouts and Girl Guides requesting connecting with Girl Scouts in our council! Please read the emails below and contact the writer, if you are interested in the opportunity! My name is Jennie Barton. I am a Troop Leader in Albuquerque, New Mexico (Girl Scouts of New Mexico Trails). I have a Daisy Troop and a Brownie Troop. We are working on Flat Daisy and Flat Brownie project. We are looking for Daisy and Brownie troops in your area that might want to participate in this adventure with us. Could you please forward this information to troops in your council? We would like to get troops from all Councils to participate. The Flat Daisy and Flat Brownie come from the children’s book “Flat Stanley”. It is the story of a young boy who gets flattened and mailed around the world. Our troops have made a Flat Daisy doll and a Flat Brownie doll. We will mail the doll and her journal to the troops interested in participating. They can do activities with her, then place pictures, badges, and stories into her journal. She is then mailed to the next troop. Troops will be able to see what adventures she has had along the way. Hi! I am a Girl Guide from Rugeley in England. My town is twinned with Western Springs in Cook County. I would like to find a Girl Scout Unit that I could get in contact with – my guides are interested in making friends from around the world. I recently went to the Centenary camp in New Jersey, which was absolutely amazing. I would really like to get in contact with a troop from there. Artalé Wine Co. will host an adults-only wine tasting for the public on Friday, April 5, from 5:30–8:30 p.m. at 6876 Spring Creek Road, Rockford, IL to benefit girl members of Girl Scouts of Northern Illinois. The event will include 30 wine varieties, along with hors d’oeuvres and dessert bites from Josef-Barbados Restaurant & Oyster Bar. Cost is $15 per person, cash, at the door. $10 of each cover fee will be donated to GSNI. GSNI’s Alumnae Association will use proceeds from the event to help girls register as Girl Scouts, attend camp, and travel. Each month, Artalé choses one non-profit organization in the Rockford area and showcases them at a wine tasting. Artalé’s wine tasting events are well-known throughout Rockford and continue to draw a crowd of loyal supporters. For more information, please contact the Artalé Wine Co. at 815-877-9463. 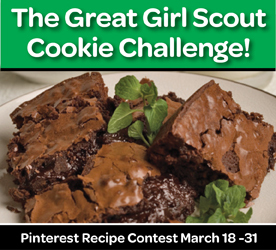 Looking for something to make for The Great Girl Scout Cookie Challenge? 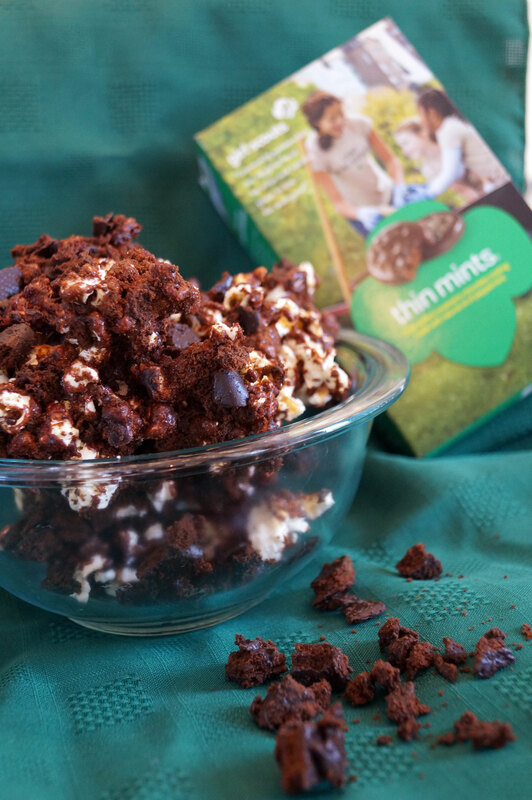 Why not try this making this Thin Mint Popcorn? Entries are accepted through March 31, 2013. Don’t miss your chance to win a basket full of baking supplies valued at $100! Preheat your oven to 250 degrees F. Line a baking sheet with foil. Rip open your popcorn bags and tear them carefully down the middle. (Basically make your popcorn bag flat with the popcorn sitting on top of it. This will cause all the unpopped kernels to fall to the bottom, so you can easily scoop up handfuls of the popped pieces only.) Place the popped kernels in a large bowl. Stir together the sugars, corn syrup, cocoa, butter, and salt in a saucepan over medium high heat until boiling. Allow to boil 2 minutes. Then stir in peppermint extract and baking soda. Mixture will foam. Pour chocolate mixture over popcorn in your bowl and stir until very well coated. Spread the popcorn onto the foil-lined sheet. Bake in the oven 30 minutes, stirring every 10 minutes. Remove from oven and sprinkle with chopped cookie pieces. Allow to cool to room temperature. (Put in freezer for 10 minutes or so if you’re impatient like me). Break into chunks and store in an airtight container. Best after aging a day or two. GSNI is hosting a contest all about camp! Have your happy camper submit a list of the top ten reasons why she loves Girl Scout camp to pr@girlscoutsni.org. She will be entered to win over $100 in Girl Scout camping supplies! Girls will be credited for their lists and featured on GSNI’s blog and social media. This contest is open only to members of Girl Scouts of Northern Illinois. All entries received before Friday, May 31, 2013 will be entered. Wal-Mart Approves Girl Scout Cookie Booths Nationwide! Wal-Mart and Sam’s Club are proud to support local Girl Scout troops with their annual cookie-selling campaigns. This year, Wal-Mart, Sam’s Club, and Girl Scouts of the USA have developed a uniform agreement to establish a consistent process for conducting the 2013 cookie campaign in front of our stores and clubs. This effort intends to ensure a strong, uniform relationship between our company and the local troops during the 2013 cookie-selling season. Wal-Mart is committed to providing the best possible store experience for our customers, and we are committed to being a strong community partner. We believe that because of this process even more of our stores and clubs will be encouraged to participate. Wal-Mart and Sam’s Club’s locations nationwide have been provided with a copy of this agreement. The decision of whether or not a particular Wal-Mart or Sam’s Club will allow Girl Scouts to have a cookie booth is decided by the manager at each store. If you are interested in having a cookie booth at your Wal-Mart or Sam’s Club location, please contact the manager, mention the new agreement, and encourage the manager to allow local girls have a cookie booth at the store. Your word as a loyal shopper and community member means a great deal to the management at each store! If you have any questions regarding the agreement between Wal-Mart and Girl Scouts, please contact Madelon Koerner, Director of Product Program, at 847-741-5521, Ext. 7120 or mkoerner@girlscoutsni.org. Happy Girl Scout Week 2013! Juliette “Daisy” Gordon Low assembled 18 girls from Savannah, Georgia, on March 12, 1912, for a local Girl Scout meeting. She believed all girls should be given the opportunity to develop physically, mentally, and spiritually. With the goal of bringing girls out of isolated home environments, and into community service and the open air, Girl Scouts hiked, played basketball, went on camping trips, learned how to tell time by the stars, and studied first aid. One hundred and one years later, Girl Scouts are still doing that and much more! “Juliette Gordon Low’s vision was to establish an organization in which any American girl could expand her horizons by having fun, exploring new interests, and contributing to society. The core of that vision was girl leadership and I am immensely proud to note that it continues to be at the center of our mission today. GSNI is proud to continue Juliette Low’s vision locally. Join us in celebrating all week on our Facebook, Twitter, Pinterest, and LinkedIn pages. If you are interested in joining our membership or volunteering, please email info@girlscoutsni.org. Unique Opportunities Available at Volunteer Connect! Coordinating Council Wide Events – Do you have expertise in event planning or interested in learning more about it? We are looking for people to help with annual events held by GSNI. These events include Thin Mint Sprint, Girl Scouts Forever, and more. GSNI Speaker’s Bureau – Do you enjoy public speaking? Did you gain valuable skills through Girl Scouting, or watch your Girl Scout learn about leadership first hand? Are you a proud Girl Scout alumnae, parent, troop leader or community partner? If you believe in the Girl Scout Movement and the benefits it provides for girls, consider joining GSNI’s Speakers Bureau! STEM Volunteers – Do you like science technology, engineering, and/or math? GSNI is looking for people to share their STEM passion with Girl Scouts. Why not volunteer to help girls become interested in these exciting fields! Plumbing/Carpentry Help – Do you have a skill in plumbing or carpentry? GSNI has facilities throughout the council that could definitely use your help! Service Unit Communications Professional – Do you like promoting events, sharing stories with people, and working with people in your service unit? GSNI’s Communications team is looking for someone to act as their liaison at Service Unit meetings and work with Girl Scout Emissaries in their area to help promote and share the stories of GSNI. This Wednesday, March 13, 2013, Girl Scouts of Northern Illinois is hosting Volunteer Connect! at our Rockford Service Center. We invite you to come and see the opportunities are available. As you know, volunteering is a great way to add to your resume, can help when applying to graduate school, and benefits the community at the same time. We look forward to seeing you this Wednesday!